Erin's Meadow is at the outskirts of Clinton, TN and is a beautiful herb farm. I have been into cooking with herbs and herb gardening for many years. I am only just finding the best places to shop and enjoy the herb farm culture here in Tennessee. The gardens are wonderful and it is in an area of abundant natural beauty. The gift shop is amazing! Local area artisans work is sold here. They sell organic gardening supplies and their herbs and native wildflowers! It is my kind of place! 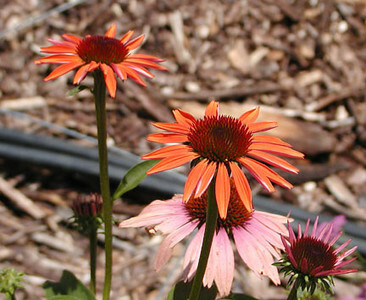 Orange coneflower--I'd never seen this variety before!